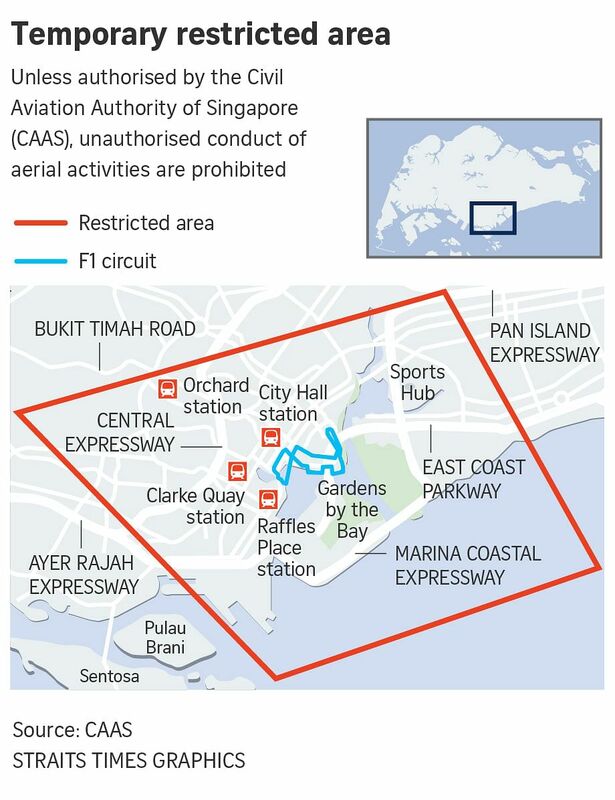 SINGAPORE - There will be a temporary restricted area imposed by the Civil Aviation Authority of Singapore (CAAS) over some parts of the island during the 2017 Formula 1 Singapore Airlines Singapore Grand Prix. This is to allow low-level helicopters to film the race from the air, ensuring the safety of both aircraft and members of public, CAAS said in a press release on Friday (Sept 8). The practice session for this year's F1 race will take place on Sept 14, while the qualifying session will happen on Sept 15. The race proper starts on Sept 16. Aerial activities such as flying unmanned aircraft, releasing flight lanterns, hoisting captive balloons and flying kites will be prohibited in those areas, unless CAAS authorised them. Unauthorised aerial activities within a temporary restricted area is an offence under the Air Navigation Order, and could bring a fine of up to $20,000 for the first offence. For subsequent instances, offenders can be fined up to $40,000, jailed up to 15 months, or both. Information on the temporary restricted areas can be found online at www.singaporegp.sg and www.caas.gov.sg.